This unique compact design of Bicycle Stand attaches to the bottom bracket/crank and holds the bicycle very stable in an upright position. This is an ideal stand for maintenance, building bikes and cleaning. 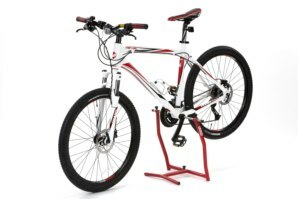 Both wheels can be removed and the bike can be fully dismantled down to frame and crank, it is also perfect for keeping your bicycle upright for storing safely when not in use. What makes this product so appealing is its easy of use and super compact size when not is use, no need for large cumbersome grab stands. 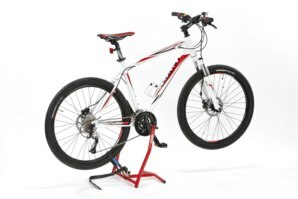 This is the perfect bicycle stand for at home in the garage or taking to bike meets, trail parks or any cyclist on the move. The abba bicycle stand will fit a vast range of bicycles. The stand comes as standard with fitting ends ready to fit all bikes with standard 8mm allen key crank bolts. (As shown below in the 1st picture) An adapter which is included is required for bicycles with hollow crank sets (2nd picture) This product is not suitable for closed face crank sets, as shown below (3rd picture). Fits a vast array of cycles including Road, Track, BMX, Trials and Mountain bikes. 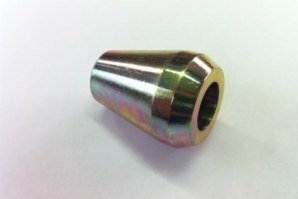 Fits both standard and hollow crank sets (see pictures for fitment guide). Simply slide the horizontal pins into the bottom bracket/crank to safely support your bicycle. Quick release bottom support arm for storage and transportation, very compact size. 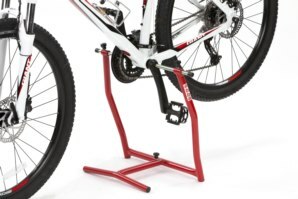 Unique self leveling design, enables you to use the stand on any surface whilst keeping the bike stable. Pedals can be fully rotated while the stand is in use. The two main sections simply slide apart to make a very "compact" product. Takes up very minimal space and can be hung flat on a wall. Laser cut tubular construction with durable powder coated finish, no cheap plastic connections or fittings. Out the box and on your bike within seconds. 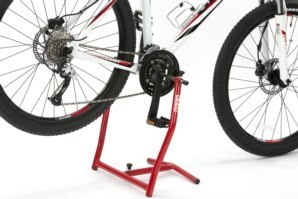 How do I Know if the stand fits my bicycle? If you have a conventional crank design you will have an 8mm Hex key hole either side of the bottom bracket/crank, you can check this by inserting an 8mm Hex key inside, the horizontal pins have ends suitable for the 8mm Hex key. If you have a hollow crank (large hole in centre on one side) you can use the hollow crank adapter included. The stand is not compatible with closed face (no holes or hex) crank sets. If your still unsure please use the "ask us" form for more help. Do I need to modify my bicycle? Is it safe to leave my bicycle on the stand long term? Of course! Thats what the stand is designed for, you can leave your bicycle on the stand indefinitely. In fact if you do not use your bicycle for one day or one year the stand will keep your bike safe and upright, taking up less space in the garage. What is the stands weight limit? The stand will easily support a weight of up to 45kg! So even suitable for most electric bicycles. Does the abba bicycle stand come with a guarantee? 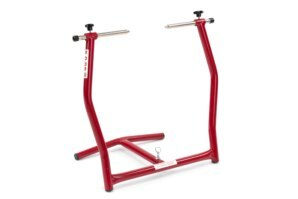 Got a Question about the abba Bicycle Stand? If you would like to ask us a question about the abba Bicycle Stand, simply fill in the form below and we will contact you within two working days. Want to tell a friend about the abba Bicycle Stand? Alternatively fill in the form below and we will send an email on your behalf to your friend, with a link to this page all about the abba Bicycle Stand.